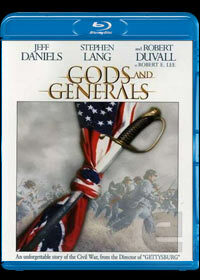 This 2003 movie is the prequel to the Gettysburg and is a 3-hour epic revolving around the American Civil War. The movie begins with the formation of both the Federal and Confederate armies as Robert E. Lee (Robert Duvall) declines the offer to join the Union army and takes his place with the south. The movie also revolves around Joshua Chamberlain (Jeff Daniels) as he wishes to fight the insurgence in the south and also Lt. Colonel Thomas "Stonewall" Jackson as his struggles with the war and life itself. This movie revolves around several characters during this turbulent time and is definitely one of the history buffs as Gods and Generals is quite historically accurate. The drama between all the characters involved is quite engaging that is complimented perfectly by the great cast of the movie itself. Match that with some violent battles and a healthy dose of action and although there is quite a lot to digest in one sitting, I would highly recommend that this movie is watched over two or even three nights to truly appreciate the scope. Although it initially begins quite slowly as the war progresses, the battles begin to build as do the storylines for the characters thanks to director Ronald F. Maxwell who really gives a unique look into the Souther army. Although not produced in high definition, the transfer to the Blu-ray is quite exceptional with sharp images and vibrant colours that is matched perfectly by the Dolby Digital 5.1 soundtrack which sounds phenomenal through our Logitech surround sound system. The soundtrack of Gods and Generals is quite majestic at best. When it comes to extras, the Blu-ray versions boasts a variety of interesting and engaging featurettes regarding a variety of facets of the original war and the movie itself. Definitely a movie for those epic film buffs or for those that enjoy a historically accurate war movie.